The What: Timecode Systems has launched UltraSync BLUE, which uses the company's patented timecode sync and control protocol. The What Else: UltraSync BLUE transmits timecode to a recording device over Bluetooth with sub-frame accuracy. 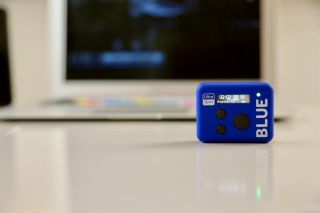 The product uses Bluetooth pairing to connect to a device, enabling timecode to be transmitted wirelessly from UltraSync BLUE directly into the media file of a connected device. The device itself measures just 55mm x 43mm x 17mm, weighs only 36g, and costs £125 ($179 or €149), making it small enough to fit neatly into a pocket during filming and affordable enough to be used on any type of production — from documentaries, news gathering, and reality shows to wedding videos and independent films. By removing the restrictions of a wired connection, crews not only benefit from the convenience of being cable-free, but also from more versatility in how they can sync content. A feature of UltraSync BLUE is the ability to use a single unit to sync up to four recording devices shooting in close range over Bluetooth — a great option for small shoots and interviews, and also for content captured for vlogs and social media. The Bottom Line: At launch, both the MAVIS professional camera app and Apogee MetaRecorder app (both for iPhone) are already fully compatible, allowing — for the first time — sound and video recorded on iPhone devices to be synchronised over the Timecode Systems network. Timecode Systems is now taking orders for UltraSync BLUE and will be shipping in October 2018.